Compliance and CPE management is serious business. Maintaining certification is of critical importance to the people who rely on their professional credentials for hiring and career advancement. 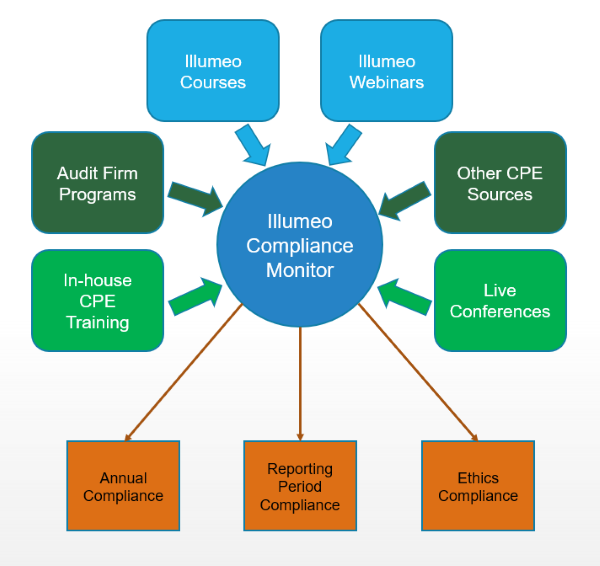 Illumeo’s Compliance Monitor™ provides easy and accurate CPE tracking and guidance of all your continuing education credits – whether earned on Illumeo or elsewhere. Via our simple yet powerful tools, you can be confident about where you are and what you have left. The CPE Compliance Monitor™ understands the rules of your jurisdictions/designations. It is updated to keep up with the changes. 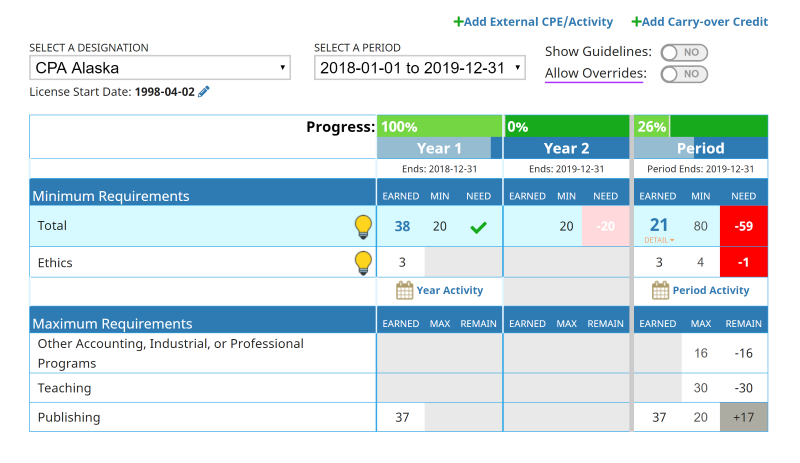 The system can automatically allocate CPE credits to your designations so you don't have to micro-manage exactly how each credit is applied for a designation requirement. 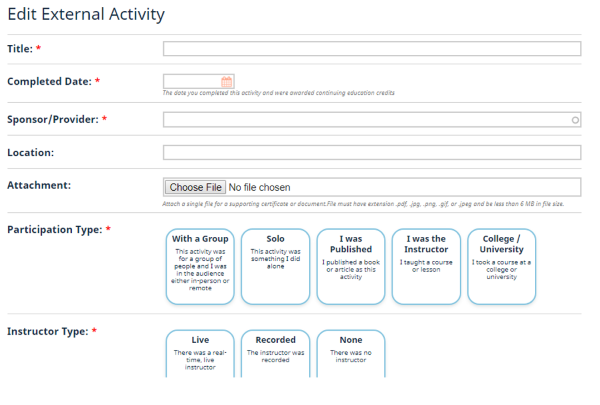 Various reports show your progress and what you need to meet a requirement or how much you may have exceeded a limit. Effective continuing education monitoring requires the coming together of many disparate elements into a seamless, easy-to-use whole. Illumeo's Compliance Monitor™ solution brings those elements together, providing powerful capability with a straightforward user experience that simplifies what was once an onerous task, fraught with risk. Our Courses, Their Courses, Conferences, Everything! We know that you get credits wherever you can. Now it's incredibly easy to track CPE no matter where you get it - even adding external CPE to our CPE manager couldn't be easier. Add it, allocate it, track it, and see where you stand. We've simplified and shortened the process for you to make it faster than ever before. Illumeo turns the hassle of CPE compliance into a much simpler proposition. We do this by providing you everything you need in one easy to use platform. 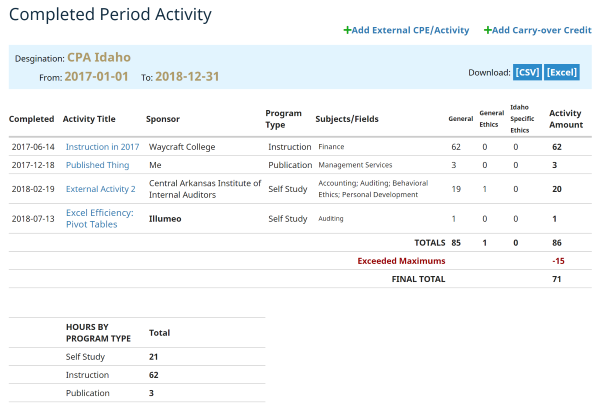 Illumeo has competency assessment, our course recommendation engine, a massive course library with thousands of CPE credits, dozens of certification types, and, of course, our CPE Compliance Monitor™. No more hunting high and low for credits, get it all here, track it all here, and sleep soundly.